Brussels is a fantastic place because it springs surprises on you at every turn. The in-laws are over this week, and we were trying to get in a long walk with them today. 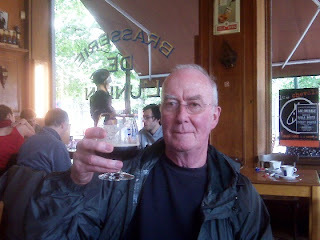 We were caught in a rain storm around Parvis de Saint-Gilles and so ducked into the nearest bar to get out of the deluge. Turns out it was the quintessentially Brussels pub, La Brasserie de l'Union, which has a great range of beers and, as we walked in, live music provided by a talented duo offering well-improvised classic jazz covers. 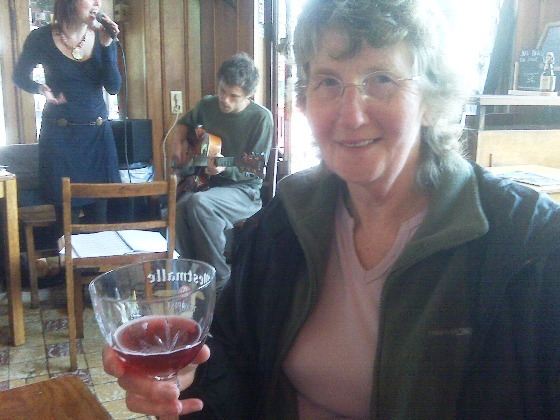 Fiona ordered an Orval, my mother-in-law went for Cantillon Kriek, my father-in-law chose his favourite, Ciney Brune, and I took a Moinette Blonde. A new beer and great music: a perfect way to wait out a storm. As one of my fellow blonde evening tasters noted the other day, there are some strange omissions in my tasting notes list. I may now be on number 181, but it’s interesting that some fairly common names are still missing a formal write-up. 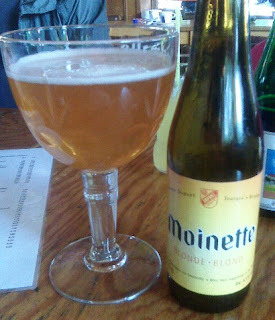 Moinette Blonde may not exactly be the lowest hanging fruit -- it’s not incredibly common -- but it is easy enough to find, and I did, after all, try Moinette Brune over two years ago. But I should have added the blonde to this blog by now. Dupont Brewery’s Moinette Blonde (8.5% ABV) is deliciously yeasty and lemony, with a citrusy pith finish. It is strong in hop, and I also sensed notes of woody rosemary. Strange that I should happen upon this strong blonde ale by chance, but I’m very glad I finally got around to it.